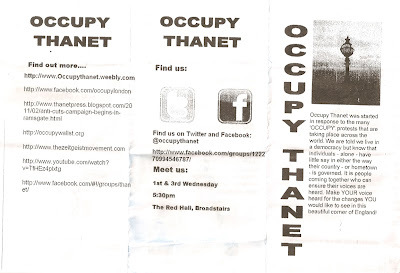 I walked to the Turner Contemporary Gallery yesterday on a bright but bitterly cold afternoon to spend an almost an hour chatting with 'Chris' from the 'Occupy Thanet' group, huddled in tents outside the gallery. Given the uncomfortable freezing conditions, we went inside to the cafe and I bought him a cup of tea to warm him up a little. The small collection of activists are made of sterner stuff than me, on a Siberian winter weekend when six inches of snowfall is predicted - see snow forecast - but like those following a similar agenda,outside St Paul's cathedral in London, are quite committed to their cause. 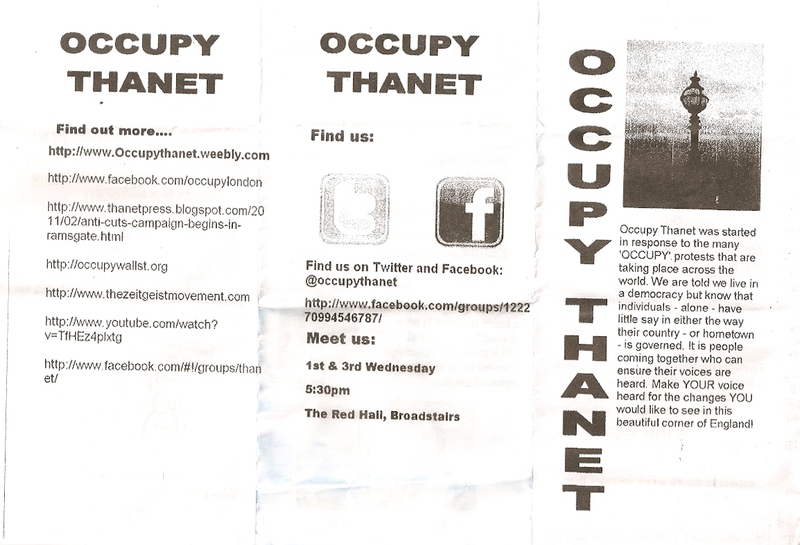 The focus of the Group's argument here in Thanet is fundamentally pseudo-Marxist and argues both that capitalism is both discredited, defunct and that the council and local politicians live in a moral vacuum. More precisely, with subjects such as Westwood Cross, Margate High Street, the Arlington and now Sainsbury's in Westgate, local government should intervene on behalf of the people. So, Westwood Cross would not have been built, legal action would have been taken against Freshwater for the state of the Arlington and some kind of new initiative would be taken to have Margate High Street repopulated with shops. I can quite understand his frustration but like many well-meaning people with a similar agenda, he won't accept that local government is both constrained by the finances it has available and has to work within the straight-jacket of the law. In Venezuala, President Hugo Chavez can walk into the centre of town with his heavily armed entourage, point at a 'capitalist' clothes retailer and have them slung out of Caracas to be replaced by a 'People's' store. The Leader of Thanet council doesn't share the same authority. Now I'm not making light of the argument because I have great sympathy for those, the 'squeezed middle' included, now suffering as a consequence of the global recession and readers will recall that I have written about this and Marxism before . And that, in a nutshell, seems to be the heart of the argument. Local government and local politicians work tirelessly to make things better. Frequently mistakes are made but its an evolutionary process at the mercy of both the national and local economy and over time processes change for the better. Chris objects to our planning laws and on Thursday evening Cabinet approved new rules from Government, under the Localism Bill, which involves local people, more than ever before, in the planning process. At this point, I have to go and assist Roger Gale at his monthly constituency surgery at Westgate library but I will attempt to add a little more to my thoughts later. TDC's powers may be limited, but there are SOME things that you can do but choose to ignore (Freshwater's at Arlington House and JG at "Godden's Gap" spring to mind!). Not quite sure what you mean by JG at Godden's Gap? I hardly think Freshwater is ignored! I had this argument with Chris yesterday. If the lease was badly written in the first place then that restricts the council's opportunity to manoeuver within the law. I mean the gap on the sea front where the building burnt down of course. Unless the owner is bankrupt (which is almost certainly not the case) then surely he can be forced to rebuild? I suspect you are living in a dream world of your own 3:57? I don't know the details of the Freshwater lease but usualy with flats the leasehold owners of the individual flats have to pay the overall freehold owners (or maintenance company or similar for their proportion of work done) and there are quite a few procedures that need to be followed to get the work done and the leasehold owners to be liable. Therefore it may not be as simple as getting Freshwater to carry out work as each flat leasholders could be left holding a very large bill for their share of the works plus an admin charge. Also improvement work is often not included in leases (obviously to limit the extent of charges that can be made) so these have to be agreed with the leaseholders so the freeholder can recover their costs. This may also limit what Freshwater can do as the owners might not want to spend money on improvements. I'm not a defender of Freshwater as I don't know a great deal about the detail of Arlington House but I do know that things may not be as simple as they seem and understandably a company is in the business of making money and is not going to spend a lot on doing flats up without a financial return. If they've already sold the flats on a term of x years which may expire many years hence why would they spend their own money doing them up unless they can get it back from the leaseholders, as the asset value increase will not be of any value to them until the lease term expires by which time the work may need to be carried out again (and again). If these circumstances are anywhere near the case it would be understandable that the Council would be somewhat restricted in what it could do. On a different point I don't really see the Group's point on Westwood Cross. If they felt people didn't want it built and that the Council should have intervened on behalf of the people why are there always so many people who choose to shop there. The 'people' could always boycott it if they don't like it and maybe they are and the majority of people are opting to use the new shops because they like it. Freedom of choice is important. Finally thanks for writing an interesting article in the first place and it's good for a Councillor to take the time to listen to the views of local people. If the terms of the lease state that the frontage of the Arlington complex, that includes the shops, is to be kept in good repair with no broken windows, no boarding of windows and no graffiti, how can the Council then allow Freshwater to get away with all of the above happening? The Council even contributing to the farcical situation by putting it's own boarding over broken windows which is left to be graffitied? Where is the responsibility of any party, Freshwater or the Council, being upheld..?